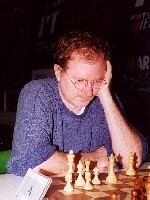 Grandmaster Kevin Spraggett is one of Canada's greatest chess treasures. He is well known for sharing his views on contemporary chess topics, including advice for improvement applicable to players of all strength. Recently he has provided some very informative comments on the chess talk web site CHESS TALK. That site currently has no facility for the archiving of gems of wisdom such as those I have preserved here. I hope that you enjoy GM Spraggett's insights to the great game, that have been captured here. I hope you enjoy as others have so far .